Ferb and Libélula at Dubaral, May 2012. Photo © the Northern Jaguar Project and reproduced from www.thenorthernjaguarproject.org. An excellent article was recently published on azcentral.com. The story, written by Brandon Loomis, concerns many aspects of jaguar conservation in the US – Mexico borderlands. But its central message is clear: building a border wall impervious to human movement would all but guarantee the extinction of jaguars in the United States. As I have written before, it appears that all of the jaguars who have been seen in the US since 1996 have come from Mexico. 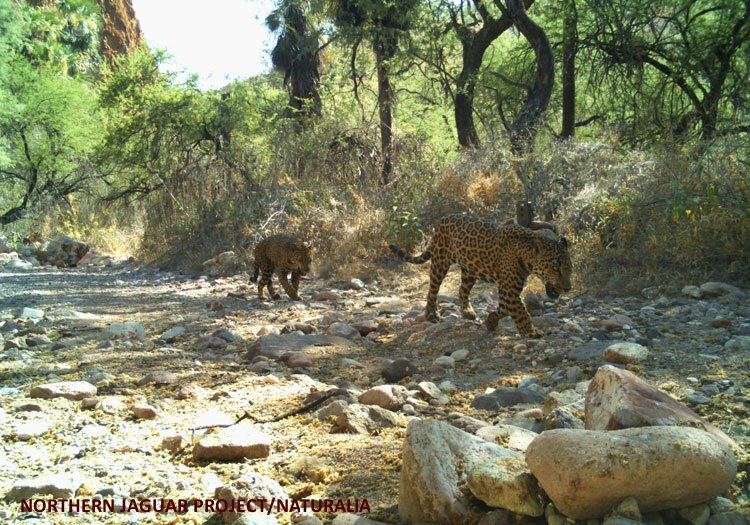 The northernmost known breeding population of jaguars lies in the Mexican state of Sonora. Jaguars, especially males, are known to travel great distances in search of their own territories – and females. Since all of the jaguars that have been recorded in the US in the past two decades have been males, it is thought that they have been dispersing individuals from Sonora. This suggests two key strategies for allowing jaguars to reestablish themselves in the US. 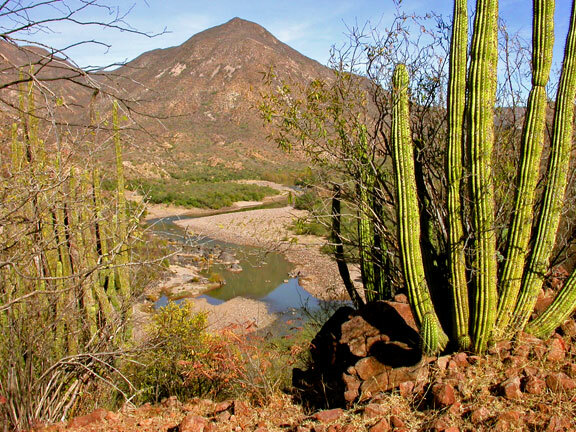 First, the breeding population in Sonora needs to be protected. A nonprofit group called the Northern Jaguar Project (NJP) is doing important work in this regard. Much of Brandon Loomis’ article details the efforts Randy Young, the manager of the NJP’s Northern Jaguar Reserve. It discusses how he got involved in jaguar conservation, as well as the challenges to protecting jaguars in Northern Mexico. A shot of the landscape in the Northern Jaguar Reserve. Rio Aros. Photo © the Northern Jaguar Project and reproduced from www.thenorthernjaguarproject.org. The second critical step in restoring American jaguars is to keep their travel corridors open. This is where the border wall comes in. Designing a wall that blocks all human passage across the US – Mexico border would almost certainly make it impossible for jaguars to move between the two countries. 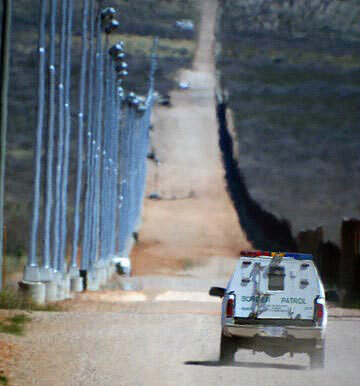 This would both prevent new jaguars from entering the US, and isolate those who are already here. As Loomis’ article points out, it is theoretically possible to build wildlife crossings into the wall. But any system that would allow jaguars to get through would likely permit the passage of humans. It is not just the wall we need to worry about, but associated activities as well. Photo © the Northern Jaguar Project and reproduced from www.thenorthernjaguarproject.org. I do not want to give away too many spoilers, because it would be far better for you to read Loomis’ story. However, I feel that the article misses one point. There is far more at stake than the ability of jaguars to return to the US. The wall’s construction and continued presence along the border could harm far more species than jaguars – as well as ecosystem processes. I also wonder what the wall and associated border security measures would do to human communities near the border, although I know shamefully little about such dynamics. As such, I question the utility of focusing solely on the proposed border wall’s impacts on jaguars. Yes, it would all but end any chance of jaguar recovery in the US. But that would be but one of the wall’s disastrous effects. I feel that Loomis’ arguments could have been stronger if he had highlighted some of the other ecological and social impacts the wall would have. This does not mean that Loomis’ article is without merit, however. On the contrary, it is full of useful information. Therefore, I highly suggest you check it out. It went well, but I have two more papers due next week! I definitely have to read the piece by Loomis, which looks like it might take a while. I think you bring up a great point. Walls can separate species and change entire environments. A good example is the rabbit fence in Australia and its unpredictable affects on climate…or should I say “predictable”. I highly recommend you read Loomis’ article, despite its length. He did a good job of presenting lots of information in a way that’s easy to understand. Oh? I’m not familiar with the climatic effects of the rabbit fence. I’ll have to look into that.